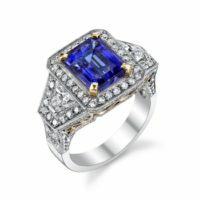 14kt two tone gold ring featuring a Tanzanite of 3.59ct prong set in yellow gold prongs. The Tanzanite is surrounded by Diamonds in a halo and flanked by 2 shield shape Diamonds. This ring has an antique style with hand etching and a yellow gold cutout under gallery. This is a Jorge Adeler custom design.